This is what you get when economic analysis starts off from ‘ideology’. A 2008 paper by Alan Blinder and Jeremy Rudd is a good example. One thing to notice: Blinder is a former Vice Chairman of the BoG and a colleague of Bernanke and Rudd was at the time of writing a member of the Federal Reserve Board. You might think that even 25 years later central bankers have a hard time ‘taking responsibility’. The irony behind the paper is that it was presented at a Conference on “The Great Inflation” that took place in September 2008, just as the economy was ‘crashing into deflation’. A further irony is that it took place in Woodstock, the 1968 mecca for ‘dissenters’ with the ‘festival’ taking place at the exact moment the “Great Inflation” was taking off! U.S. inflation data exhibit two notable spikes into the double-digit range in 1973-1974 and again in 1978-1980. The well-known “supply-shock” explanation attributes both spikes to large food and energy shocks plus, in the case of 1973-1974, the removal of price controls. Yet critics of this explanation have (a) attributed the surges in inflation to monetary policy and (b) pointed to the far smaller impacts of more recent oil shocks as evidence against the supply-shock explanation. This paper reexamines the impacts of the supply shocks of the 1970s in the light of the new data, new events, new theories, and new econometric studies that have accumulated over the past quarter century. We find that the classic supply-shock explanation holds up very well; in particular, neither data revisions nor updated econometric estimates substantially change the evaluations of the 1972-1983 period that were made 25 years (or more) ago. We also rebut several variants of the claim that monetary policy, rather than supply shocks, was really to blame for the inflation spikes. Finally, we examine several changes in the economy that may explain why the impacts of oil shocks are so much smaller now than they were in the 1970s. MattD. He’s wrong. 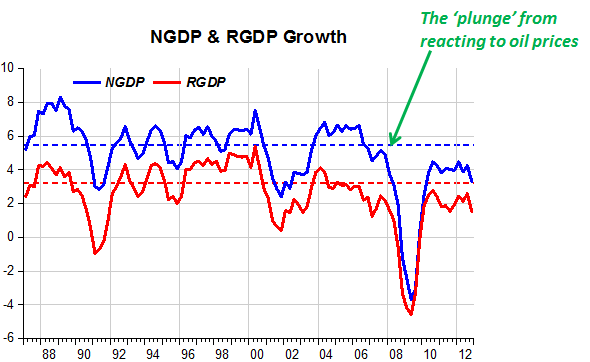 If supply shocks were the problem you’d see normal NGDP growth, low RGDP growth, and high inflation. 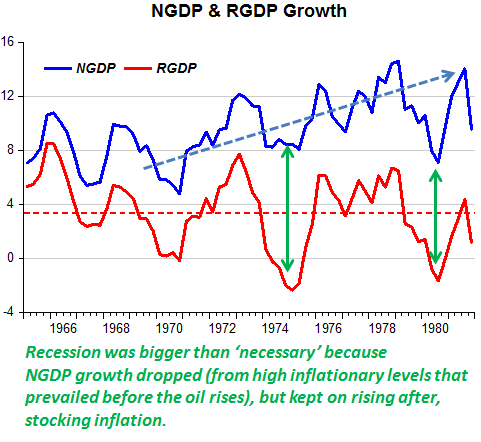 But instead we had normal RGDP growth (3%), absurdly high NGDP growth (11%/year in 1972-1981), and high inflation. It was obviously caused by money printing, which accelerated sharply in the mid-1960s. It’s not even a debateable point. 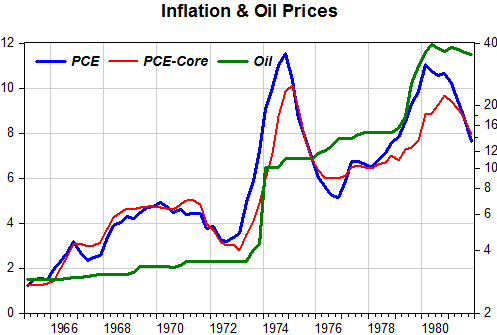 The oil price shock of 1973 was caused by (not the cause of) the rising inflation that began in the second half of the 1960s. The oil producing countries (at the time a much smaller group than today and heavily concentrated in the Middle East) were seeing their main ‘asset’ depreciate in value given that the dollar price of a barrel of oil had been more or less constant since the 1950s. After 1971, when the dollar depreciated strongly against major currencies, the losses were multiplied. The Arab-Israeli conflict in late 1973 was just a convenient excuse for jacking up the price of oil. The price shocks (from oil/commodities) after the mid-eighties (up to 2006) had much smaller effects because monetary policy managed to keep NGDP on an ‘even keel’. 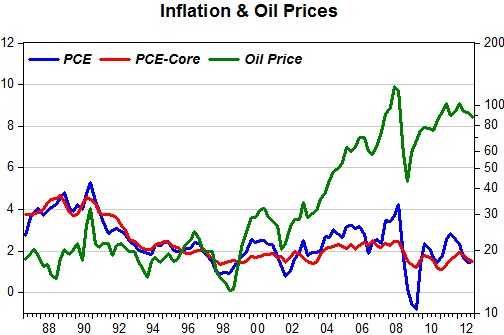 When in 2007 monetary policy began reacting to oil prices, being ‘tightened’, we had the opposite of the 1970s. Instead of the “Great Inflation” we got the “Great Recession”. A ‘beautiful symmetry’! Update. The charts below illustrate the “Great Moderation” and the ‘plunge’ into the “Great Recession.